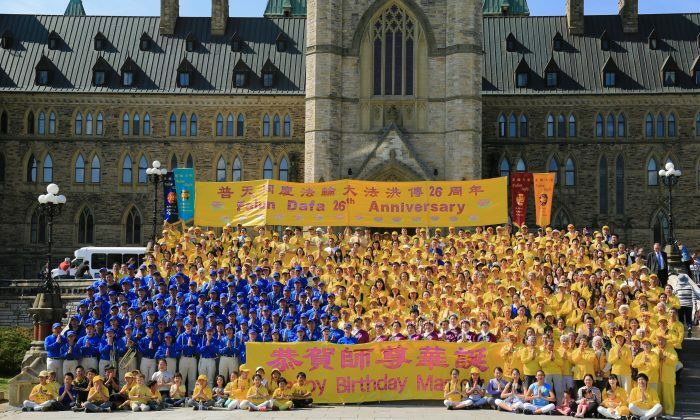 The lawn on Parliament Hill on May 9 resembled a ray of sunlight as hundreds of adherents of Falun Dafa wearing bright yellow shirts gathered in celebration of their traditional meditation practice handed down from ancient China. 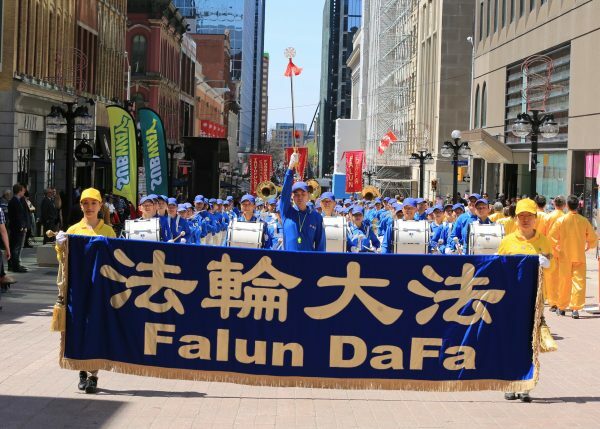 The event, marking Falun Dafa Day, which is officially May 13, included demos of the practice’s meditative exercises as well as a parade, performances of Chinese dance, singing, and a performance by a waist drum troupe. “Thank you for making Ottawa gloriously yellow today. 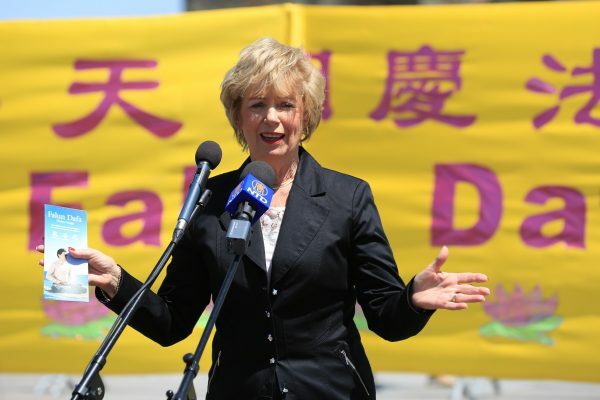 … Thank you for bringing the Falun Dafa to Canada,” said veteran Liberal MP Judy Sgro, one of the over a dozen elected officials and other VIPs who spoke at the event. “The messages that you deliver of peacefulness, compassion, respect, are the messages that all of us in Canada need to think about every single day,” Sgro said. 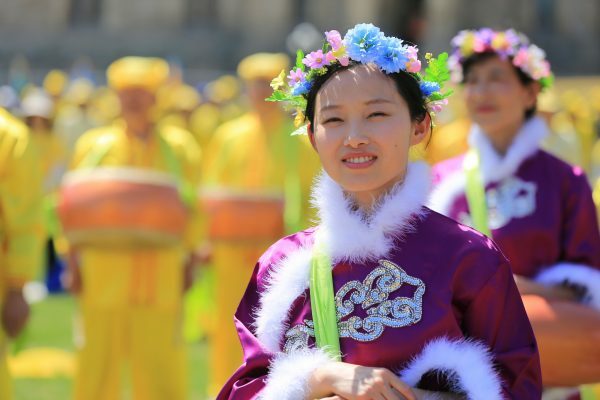 Falun Dafa, also known as Falun Gong, is an ancient meditation practice that was made public by Mr. Li Hongzhi in China in 1992 and then spread around the world. The practice consists of a set of gentle exercises and follows the moral principles of truthfulness, compassion, and tolerance. 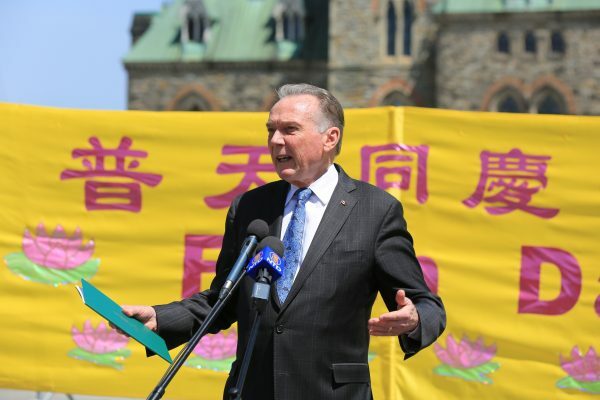 “It’s good to be with you again on Parliament Hill, and welcome,” said Peter Kent, a Conservative MP and former cabinet minister who has regularly attended Falun Dafa Day events in Ottawa and Toronto. 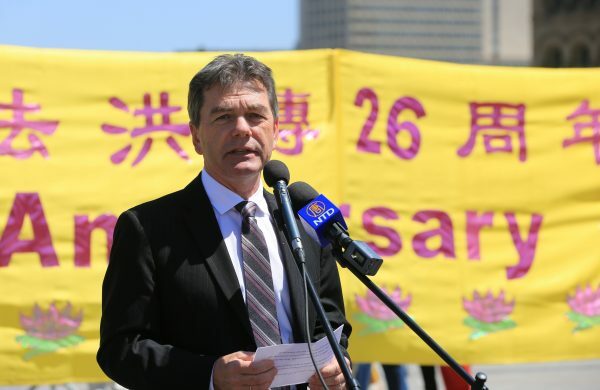 Conservative MP Larry McGuire commended Falun Gong adherents for making the world a better place by following their principles. “I support the efforts that you’re doing with regards to the peacefulness of the mind, and dealing with the individuals that need that help,” he said. Andrew Bennett, Canada’s first religious freedom ambassador under the Conservative government, also spoke. 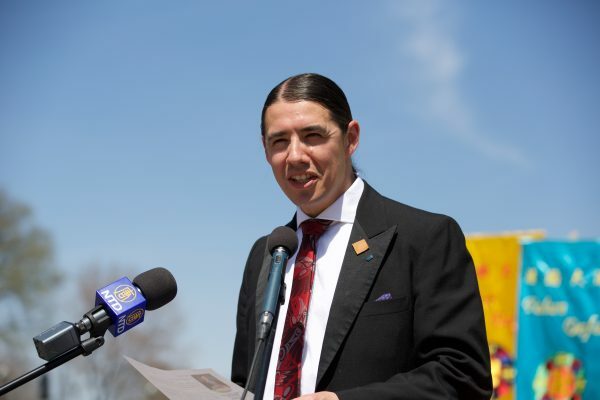 Liberal MP Robert-Falcon Ouellette, a former professor of indigenous studies at the University of Manitoba, told of his personal experience at his university observing how Falun Dafa meditative exercises helped his students maintain mental and physical health. “They sometimes were not able to concentrate for long periods of time. Many of them were older students who had not succeeded in school, and so I was looking for something to help them concentrate … something related to meditation,” explained Ouellette. For help, he turned to fellow faculty member Maria Cheung, an assistant professor of social work and a Falun Dafa practitioner. Cheung taught his students about Falun Dafa. “The students had never seen anything like that in their lives before and they very much appreciated everything they learned,” he said. One common theme that virtually all of the speakers addressed was the ongoing campaign of persecution of Falun Dafa in China. Fearing the immense popularity of the practice, with over 70 million practitioners by the late 1990s, then-Chinese Communist Party leader Jiang Zemin launched a brutal campaign against its adherents. The campaign has claimed an unknown number of lives, often due to torture, and left hundreds of thousands of families shattered. 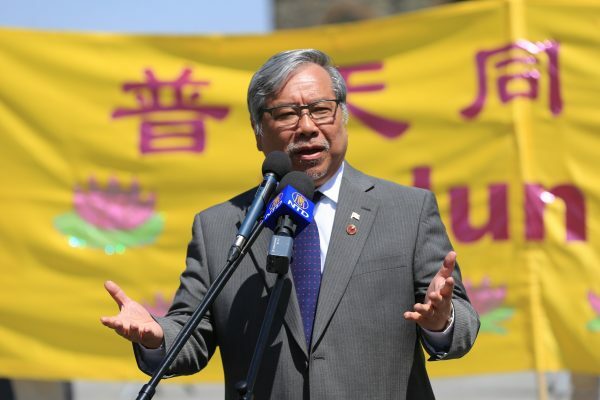 Senator Thanh Hai Ngo, an advocate of human rights, encouraged Falun Dafa adherents to continue to seek an end to the persecution. “When I see a big, big crowd like this, it shows that you are really, really fighting for your human rights. …. 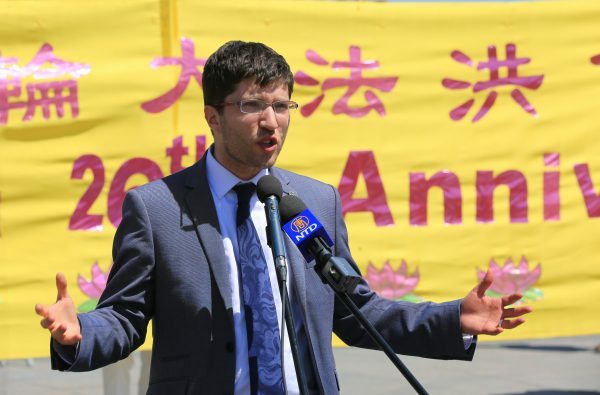 The Chinese government has to acknowledge this is not right for them to suppress the Falun Gong,” he said. Conservative MP David Anderson said everyone should be assured freedom of belief, and called on the Chinese regime to stop the persecution. “It’s time that the regime in China began to practise truthfulness, that they learned the value of forbearance, and that they began to show compassion to their own citizens,” Anderson said. 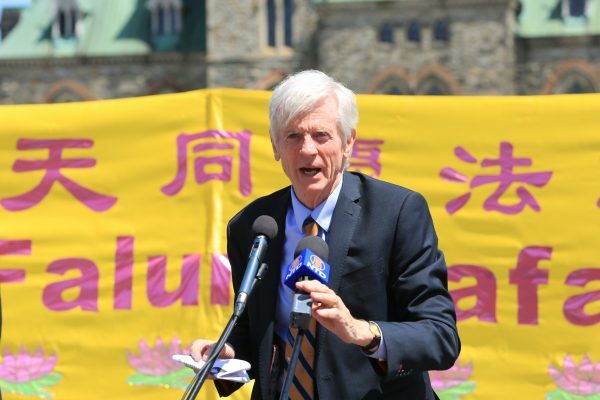 David Kilgour, a former MP and secretary of state for Asia-Pacific, talked about the in-depth investigative work he did with international human rights lawyer David Matas, uncovering China’s horrendous practice of harvesting organs from living Falun Dafa adherents. “Human trafficking is a terrible thing to do anywhere in the world. Trafficking in human organs where, in the case of China means the death of the so-called donor, is even worse,” said Kilgour. Referencing his research with Matas and American author Ethan Gutmann, Kilgour said that about 150 people are being killed daily in China for their organs. “The Party state’s current narrative … is to try to get people to believe that this all stopped on Jan. 1, 2015. We know better. I think all of you know better,” he said. 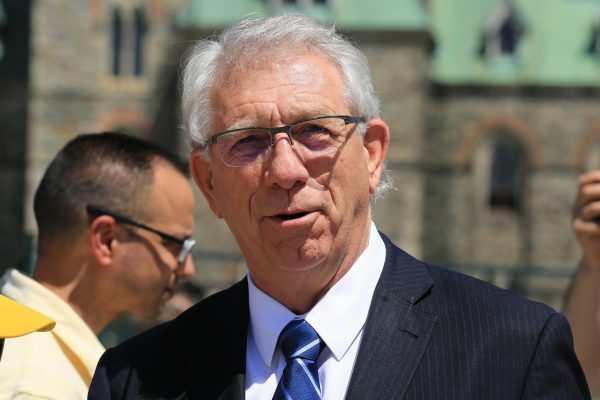 Conservative MP Garnett Genuis talked about the private member’s bill he has introduced in Parliament to target the issue of organ trafficking, as well as Senate bill S-240 introduced by Sen. Salma Ataullahjan on the same issue. “It’s been a cross-party initiative, and this bill would do two things,” Genuis said. “If in any country or any region, organ harvesting or other kinds of persecution occurs, all of us should work together to oppose it,” Weston added. 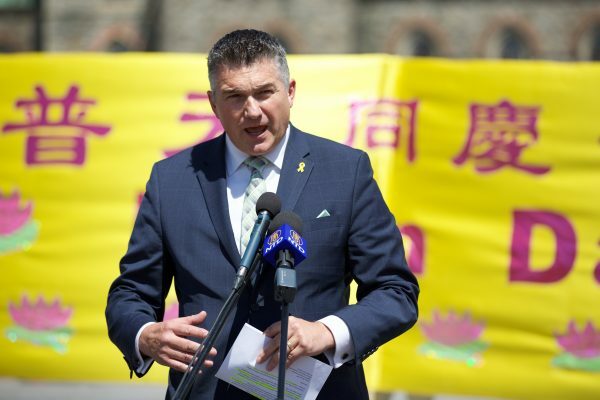 Conservative MP James Bezan, who was one of the champions of getting Canada’s version of a Magnitsky Act passed, said Canada now has more tools to hold international human rights violators to account, including those who persecute Falun Dafa in China. The legislation, named after Russian dissident Sergei Magnitsky, enables Canadian authorities to impose sanctions on human rights violators around the world, deny them visas, and seize their assets. “I want you to know that everyone here in Canada stands with you to fight against this oppression, to fight against the murderous regime in Beijing, and to ensure that your faith will flourish there and around the world,” he said. “I know, and I share with all of you the dream that one day, all Chinese citizens will enjoy the freedoms of speech and assembly, all the democratic rights that we too often take for granted here in Canada,” he said.